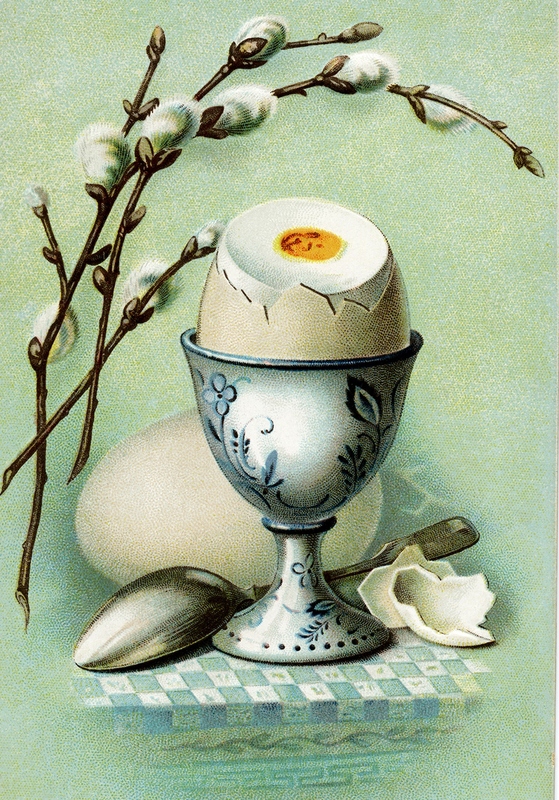 This image is cropped from an Easter postcard on the Old Design Shop, a vintage image treasury. eggs for dinner are a light, quick fix. to a life of laying thanks is owed for this. I started wondering about the morning egg. How might it be different to the lunchtime egg or the evening egg? In older vegetarian cookbooks eggs are often praised for their versatility. In a contemporary world informed by animal rights and the ethics of food production, the egg is not merely a versatile wonder capsule. It’s a sustainability quandary and choosing your half-dozen can be a political animal ethics statement. Omitting eggs can be as much a statement. Vegan baking and brunches are characterised by their ingenious egg replacements. After many years of restricting egg consumption (as the yolk were identified as cholesterol minefields) and nearly two years of almost no egg consumption, these “chicken periods” (as a friend once called them) are once again a regular part of my diet. £1 for half-a-dozen will feed me for three to four meals, usually boiled or scrambled.